Now that I’ve posted up the final selection of photographs from We English on the gallery page I thought it would be beneficial to publish my commentary that will feature in the back of the book. I’ve not written about every picture, rather, chosen to discuss a selection of the photographs which provide a context and reasoning behind my approach to the work. Hopefully it will prove useful and illuminating. For regular readers of the blog, some of this information will already be familiar. I was born in Croydon, South London, in 1974. My mother is a Northerner, hailing from Cleator Moor in Cumbria, who met my London-born father when they were both working in the capital. My formative years were spent in Oxted, a provincial town in Surrey’s commuter belt, while holidays were often spent walking in the Lake District (usually in the rain) or visiting my grandparents in Angmering, a retirement town on the South Coast. Unremarkable beginnings, you might think, and for many people, they are merely typical childhood memories. Yet they spark off a range of associations and images, of feelings and senses, which all helped begin the process of making We English. Initially, I was simply thinking about Englishness and how my upbringing had been quintessentially English. How much of this was an intrinsic part of my identity? In what ways was my idea of what constitutes an ‘English life’ or English pastimes (if there are such things) different to those of others’? My own memories of holidays, for example, were infused with very particular landscapes; the lush green-ness around Derwent Water or the flinty grey skies – and pebbles – of Angmering’s beaches. It seemed to me that these landscapes formed an important part of my consciousness of who I am and how I ‘remember’ England. Having returned from Russia in late 2005, where I’d spent a year travelling across the country to produce the book Motherland (Chris Boot Ltd, 2007), I was ready to develop some of the same themes that I found in Russia. Motherland was an exploration of, among other things, the Russians’ attachment to their homeland. This attachment to place was somewhat mysterious, simultaneously profound and mundane, and it led me to think about my own attachment to England. So We English also began as a development of my Russian work, springing from my fascination with peoples’ (and my own) sense of belonging, of memory, identity and place. And We English would be another journey, not quite as epic as the one across Russia, but nonetheless involving a 1993 Talbot Express Swift Capri motorhome, a two year old, a pregnant wife and my apparatus of choice: a 5×4 large-format camera. 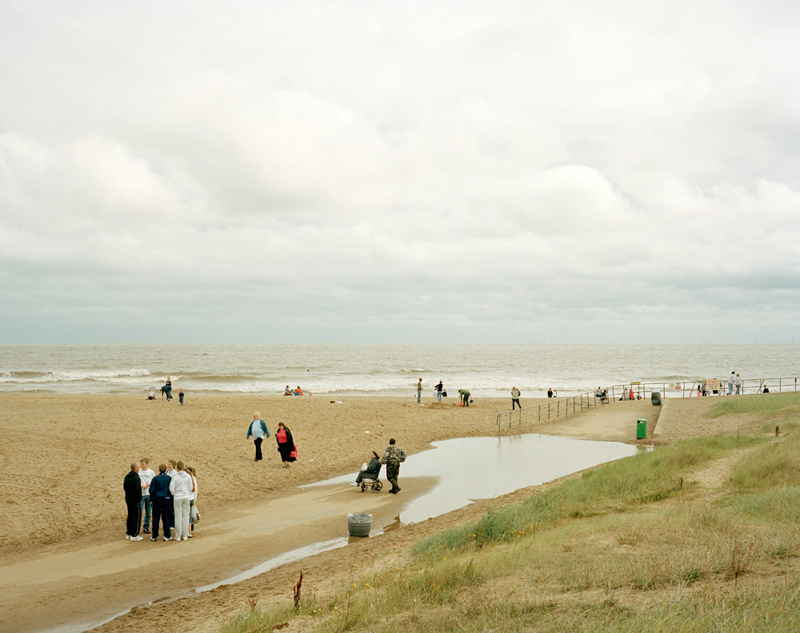 This image from Skegness was one of the first photographs I took during an initial research trip for the project in August 2007. When I saw this photograph on the contact sheet afterwards, I knew I’d begun to develop a formal composition to my framing which would define the direction of the work. I would move away from photographing the individual and engage instead with the idea of the collective, of groups of people populating the landscape. Photographing from elevated positions (often from the roof of the motorhome, as it turned out) would enable me to get a greater sense of people’s interaction with the landscape and with one another. I also decided that the figures would be relatively small in the frame, although not always so small that you couldn’t make out some facial expressions, what they were wearing and their activities. This way of seeing was influenced by looking at the work of 16th-century Dutch and Flemish landscape painters – particularly Hendrick Avercamp, Pieter Bruegel and Lucas van Valckenborch, who depicted winter scenes teeming with life. I liked the idea of what appeared to be predominantly pastoral landscapes becoming, on closer inspection, multi-layered canvases, rich in detail and meaning. I set myself a fairly rigorous framework within which to work, in terms of geographical boundaries (England, not Britain) and composition (landscapes, not portraits), and I fixed on leisure as a thematic starting point. Looking at leisure activities struck me as a thought-provoking way of exploring England’s shifting cultural and national identity. They seem to say much more about who we are than, for instance, what we do in the workplace. Leisure activities can be aspirational, revealing as much about how we see ourselves as how we wish others to see us. And landscape is an intrinsic part of these leisure experiences. It is a commodity: we consume it and utilise it and make it ours, even though we rarely own it. So I decided to produce a series of detailed colour landscape photographs – tableaux – which would record places where groups of people congregate for a common purpose and shared experience. It is worth noting, of course, that one person’s leisure often involves another person’s work. 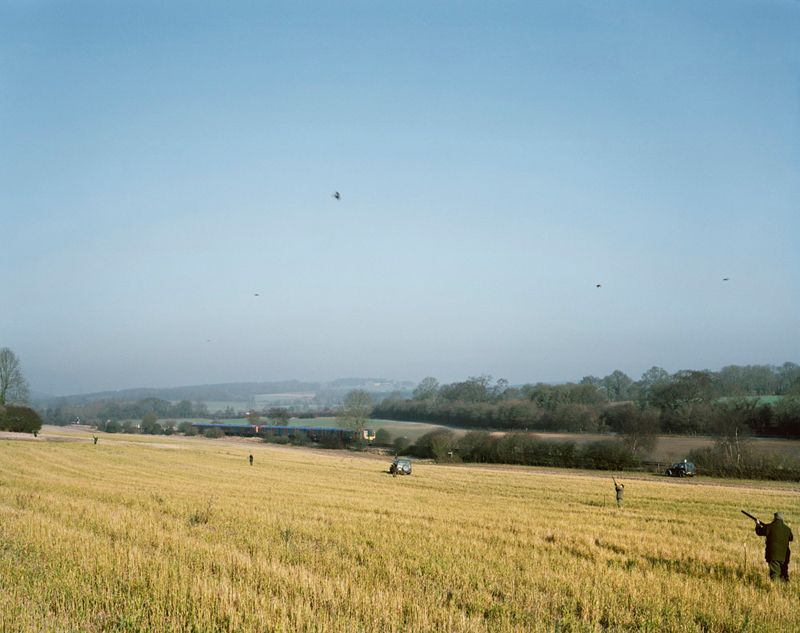 This is particularly true of a pheasant shoot, where there are as many people working – gamekeepers, dog handlers, and beaters – as there are members of the shooting party. We English is resolutely not a catalogue of quirky pastimes undertaken by eccentrics. In fact, I discovered that most unusual English events had long been taken over by the marketeers and were obtrusively sponsored, organised and formalised. This photograph, though, I like – partly because the 700-year-old tradition it depicts seems both contemporary and timeless. Every year, villagers in Westwoodside and Haxey compete for possession of ‘the Hood’. The custom began after a certain Lady de Mowbray was out riding her horse one day, and a sudden gust of wind blew her hat off. The local farm labourers chased after it, and Lady de Mowbray was so pleased to get her hat back that she named the person who returned it to her ‘The Lord of the Hood’. 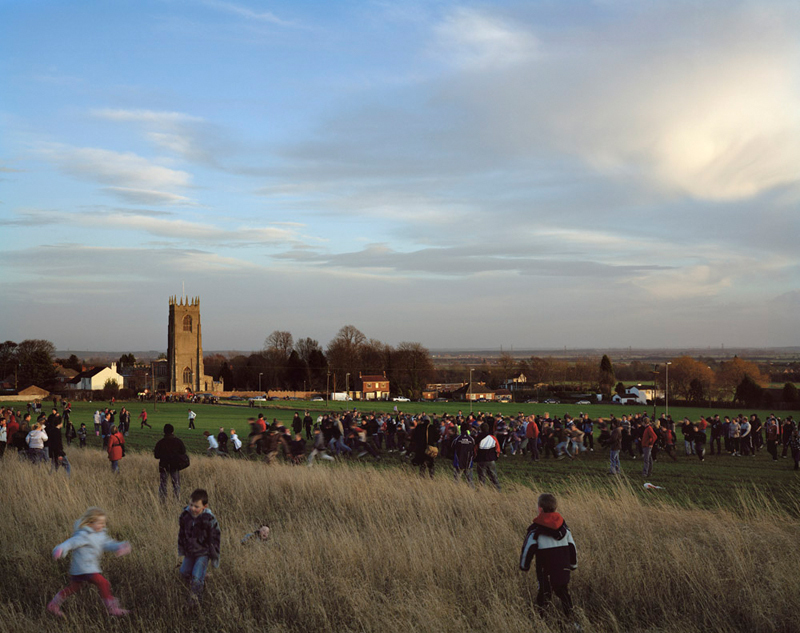 The event takes place on the Twelfth Night of Christmas, in a field in Haxey, Lincolnshire, and it’s believed to be England’s oldest traditional tussle. Here, the figures are unmistakeably 21st century, but the landscape is Constable-esque, with the church spire, flat horizon and rolling skies. I wanted to produce a body of work that was beautiful, where England was rendered in an unashamedly lyrical way, even if the landscape depicted was somewhat banal. 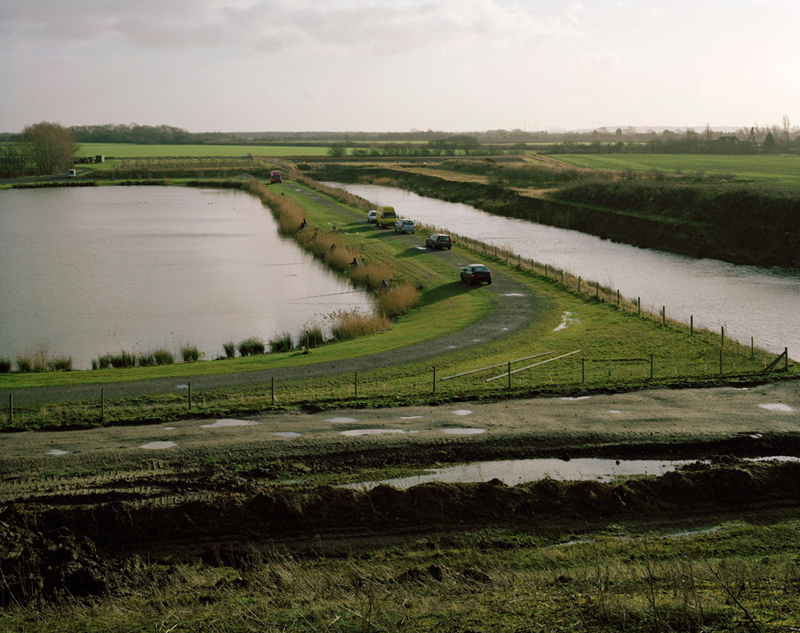 These man-made lakes in Finningley, South Yorkshire, are used for carp fishing. In many ways it is an unremarkable scene, but I imagined that to these fishermen it was a place of refuge, relaxation and even contemplation. Each occupies his own private space, hidden from his neighbour’s view by the rushes and reeds. They seek solitude despite being in a shared space. Their positioning, and even that of their cars, makes its own pattern and shape on the landscape. The effect is regimented and neat, suggesting a ritualised aspect to fishing, and illustrating the paradox of how our wish to ‘commune with nature’ and ‘be at one’ with it is set against the seemingly unstoppable desire to colonise and demarcate the area around us. My formal training as a cultural geographer has certainly influenced my work as a photographer. The question of how photographs are important to the construction of senses of place has informed my approach to both Motherland and We English. In the latter, I became interested in exploring the idea that landscapes need to be decoded. 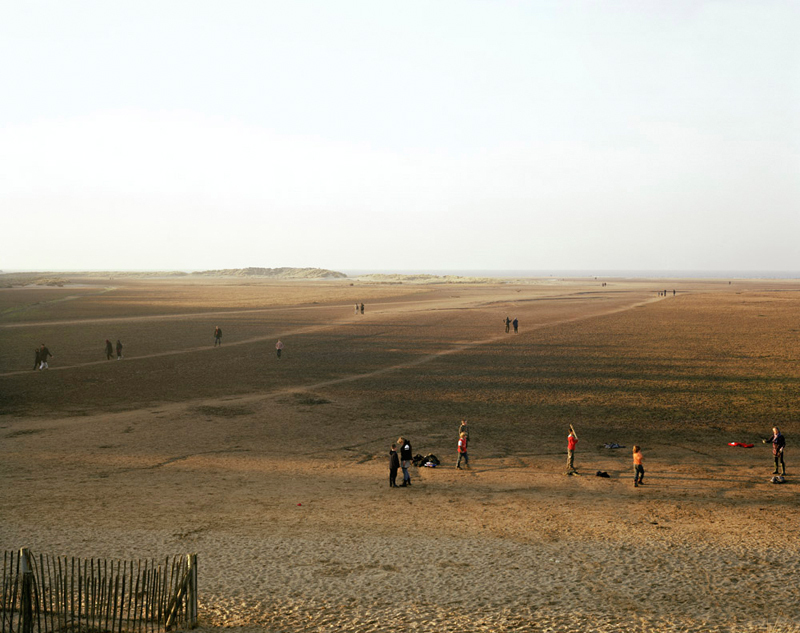 This photograph of Holkham National Nature Reserve on the North Norfolk coastline is an example. Here I present a landscape swathed in soft dusky sunlight, bringing together a game of rounders, with a mother chastising her child for unfair play, and a trail of people meandering down to the sea. Holkham has long been a place of pilgrimage for holiday-makers and was recently voted ‘Best Beach 2009’ by readers of Coast Magazine. As with so much of the English countryside, the visual appearance of this stretch of coast is part wilderness and part constructed landscape. As a result of its proximity to Sandringham, Holkham has often been linked to the Royal Family. It was particularly popular with the Queen Mother, whose own entourage, using the beach in the 1930s, were rumoured to have been responsible for establishing this stretch of sand as a gay beach. Before this, in the 1880s, class collisions in Norfolk were most clearly found in areas where people spent their leisure time. With the development of rail links from London, the Norfolk coastline had begun to attract more socially diverse groups, which meant that the middle classes – who were used to distant and uncomplicated relations with the lower classes – found their holiday-making changed into something much less relaxed. And more recently, in the early 1990s, the press were alerted to a campaign by English Nature, who manage the Holkham estate, to attempt to ‘clean up’ a nudist beach. The local warden declared he would seek a citizen’s arrest on anyone he found cavorting naked in the dunes and woods. In all these ways, it becomes evident that an apparently harmonious, even idyllic, landscape, is rarely simply that; rather, it can be a place of conflict, with different groups of people contesting its ongoing usage, preservation and value. Although I had made several solo trips since starting this work in August 2007, the main leg of my English journey began on May Day 2008, when I was joined by Sarah, my wife, and our daughter, Jemima. Our journey lasted five months – part pilgrimage, part ‘grand tour’, and part survival course (given that we lived and worked in a confined space with a very energetic toddler during one of the wettest English summers on record!). During the journey, I occasionally sought out places that I believe helped shape my own feelings of Englishness. 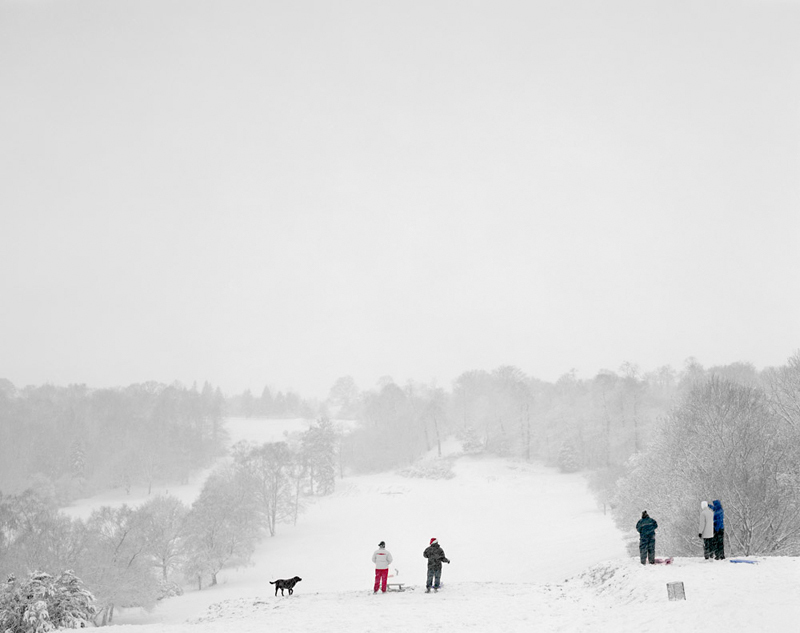 This scene on the 17th hole of Tandridge Golf Club is near my parents’ home in Oxted and is a place where I used to toboggan as a child. Seeing the families playing there, and now accompanied by a young family of my own, it became apparent that childhood experiences of holidays and leisure are a complex influence, sometimes inspiring love and loathing in equal measure, but often making an indelible imprint on our consciousness of who we are and where we come from. Since I went tobogganing as a child, I would think to do the same with my children. Our history and its associations are vital to our relationship with the landscapes around us. I hope that this photograph captures this esoteric sense of the traditions that inspire belonging, without being sentimental and despite the simplicity of the activities. 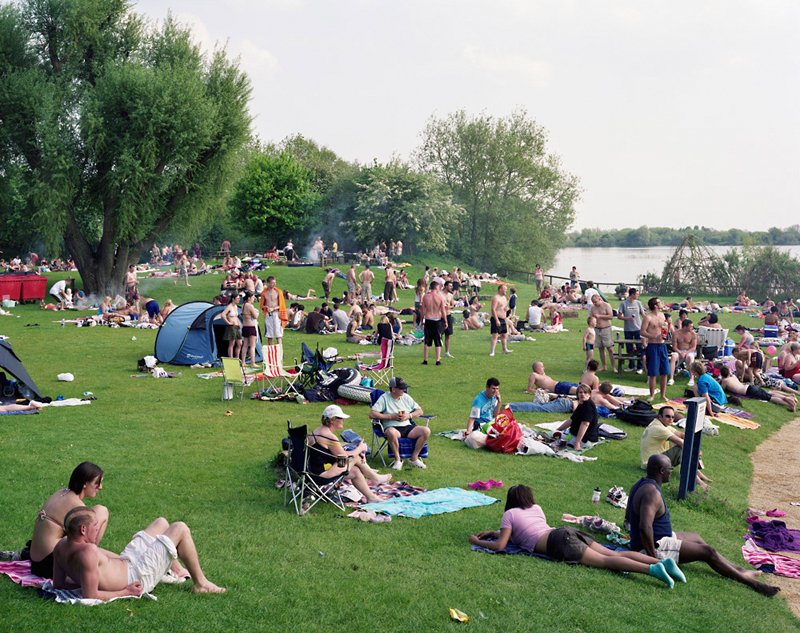 In a number of the photographs, scenes of modern-day leisure take place on what were once industrial sites. For instance, the flooding of gravel excavation pits a few years ago created the Cotswold Water Park, which now boasts the largest inland beach in England – Keynes Country Park Beach. Much of the gravel, which had been extracted for over 60 years, was used for building projects in the region. In most places I visited, I bought a local newspaper to find out about local events and gain some insight into the area. I also found community and village notice boards a valuable resource. 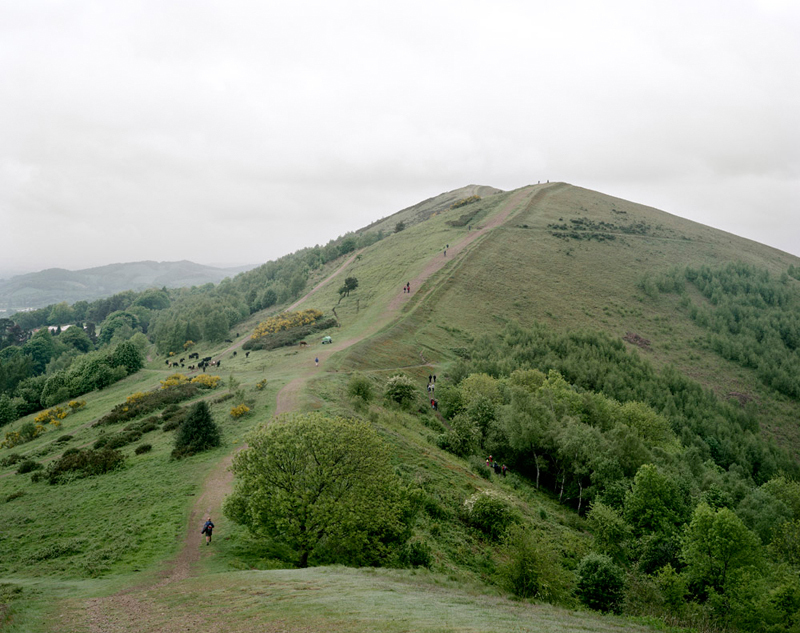 This is how I came to photograph the Malvern Hills Sponsored Walk in aid of the St Richard’s Hospice Foundation. Along with my blog from the project, the website has become a kind of living archive, a diary, tracing its own trail of ideas, debate, questions and insights. 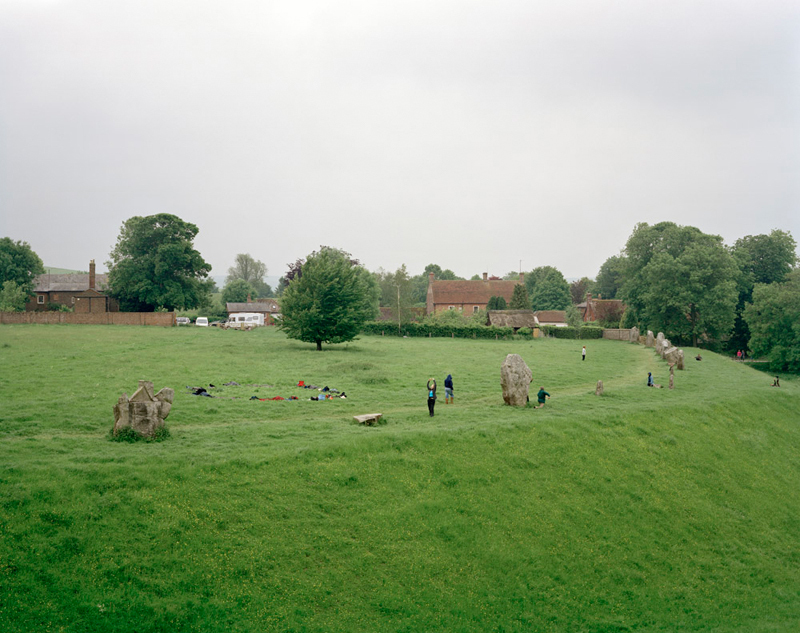 This is the scene that greeted me en route to Stonehenge: about a dozen men and women performing what looked like a form of Tai Chi on and around the rocks that make up the Avebury Stone Circle, one of Europe’s largest prehistoric stone circles. Others lay in the grass with their arms and legs in the air. The group were in fact performing a series of exercises known as ‘Amerta’ moves, part of a ‘Human Nature Ritual Art’ workshop led by Suprapto Suryodarmo, the Indonesian creator of the Amerta Movement. I thought of William Powell Frith’s painting The Derby Day (1856–58) when confronted by the crowds in the area known as The Hill at the Epsom Derby. The Derby is considered one of the most prestigious flat thoroughbred horse races in the world, and the first recorded race took place in 1661. 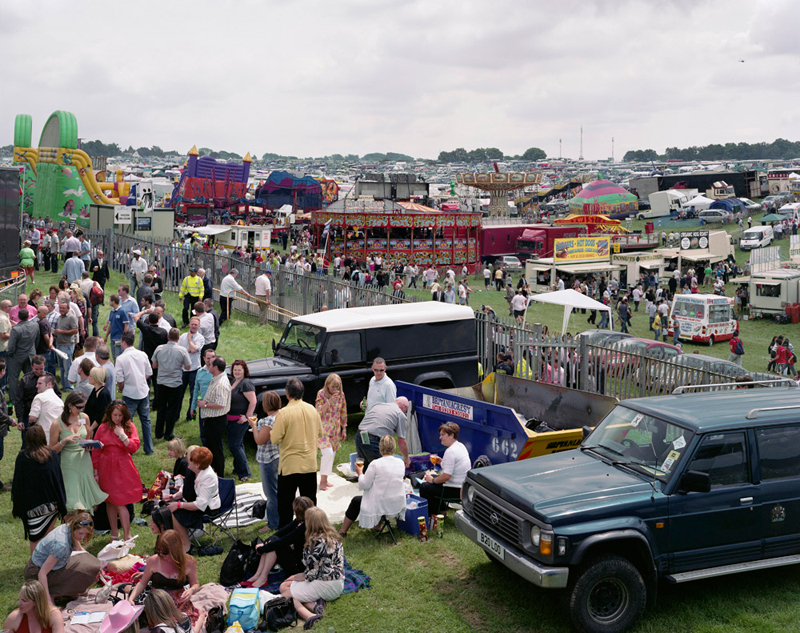 For spectators, the Derby has long been known for its unique party atmosphere and for the full range of social classes on view, particularly on The Hill, where entry to the centre of the course is free. This photograph is my own contemporary re-creation of Frith’s scene. 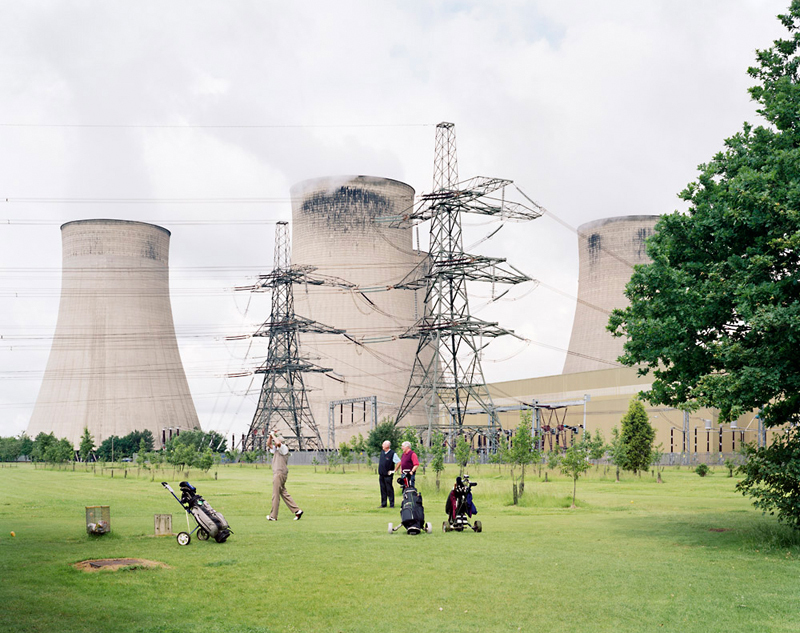 Ron Whitby, Derek Allen and Tom Burns play a round of golf in the grounds of the Ratcliffe-on-Soar coal-fired power station. The three men started work at the power station in 1966, during its construction, and were employed there until their retirement a few years ago. Despite no longer working at the plant, they still return to play on the employee golf course several times a week. 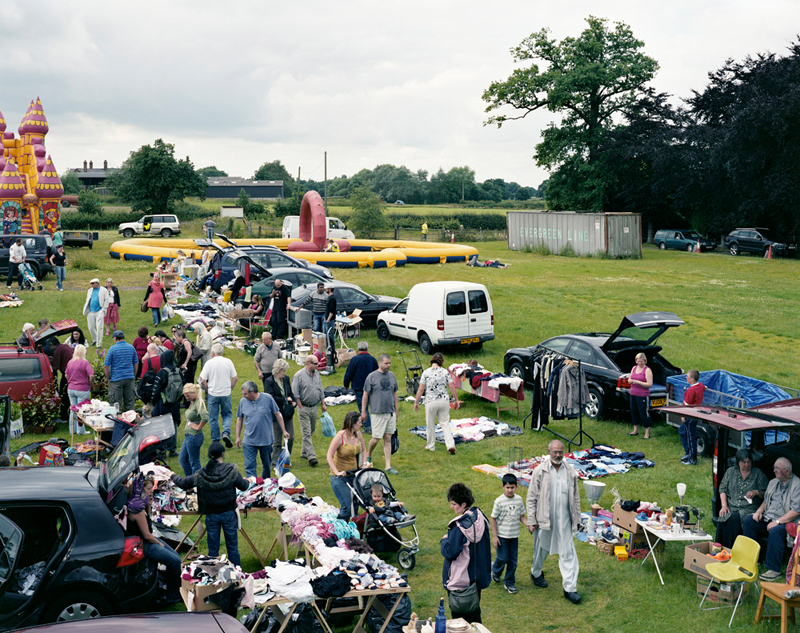 The Chelford Car Boot sale, held every Sunday in a field outside the village of Marthall, is purportedly the second largest in England. It was started by Richard Scott twenty years ago to supplement his income as a farmer, and now attracts thousands of visitors and sellers from across Cheshire. I’ve long been fascinated by the tradition of the road trip in photography. Two of my early influences, the photographers Stephen Shore and Joel Sternfeld, have both employed extended journeys as an avenue for exploring America’s cultural landscape. Similarly, many writers and artists have also made extensive journeys to produce work, from H.V. Morton’s In Search of England (1927) and J.B. Priestley’s English Journey (1934) to Daniel Defoe’s A Tour Through the Whole Island of Great Britain (1724–26) and Patrick Keiller’s film Robinson in Space (1997). In his diaries, J.M.W. Turner talks about extended summer trips around England, where he’d take time to visit his patrons and undertake new commissions. He worked in areas that attracted well-to-do summer tourists and their families, sketching scenes they might like to remember and admire again in watercolours. 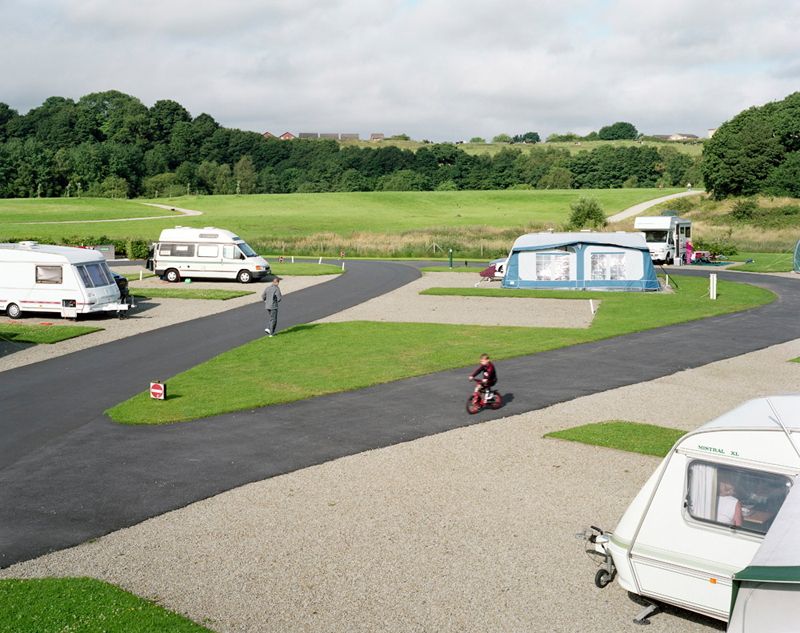 However, this image from the Caravan Club site in Bury reminds me of the fact that lots of families holiday locally, travelling only a few miles from their homes in search of ‘leisure’. The process of setting up the 5×4 camera was quite laborious and often very public, but this turned out to be a help in capturing each scene as it unfolded before me, without any intervention on my part. 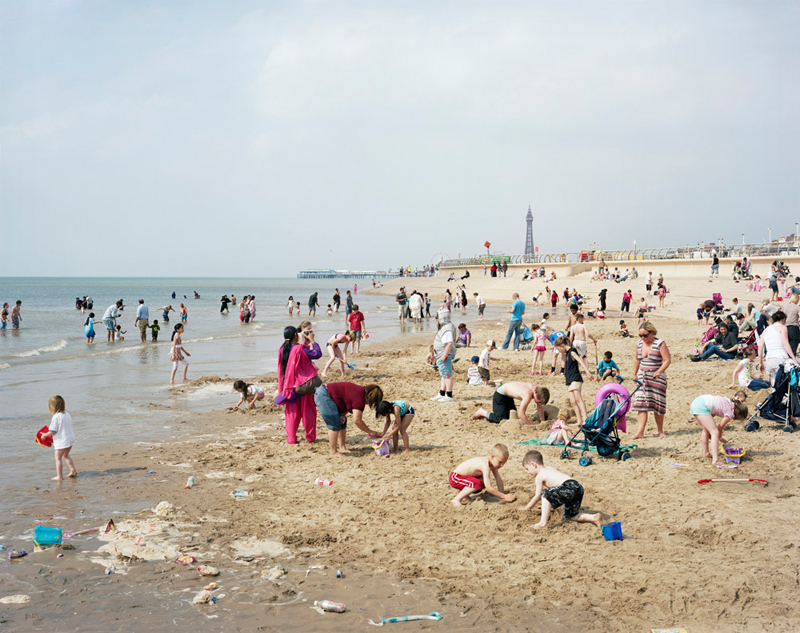 I had anticipated that there might be problems in situations where there were lots of people close to the camera – like this scene on Blackpool beach – but by the time I’d finished setting up, any curious onlookers had lost interest and turned away. 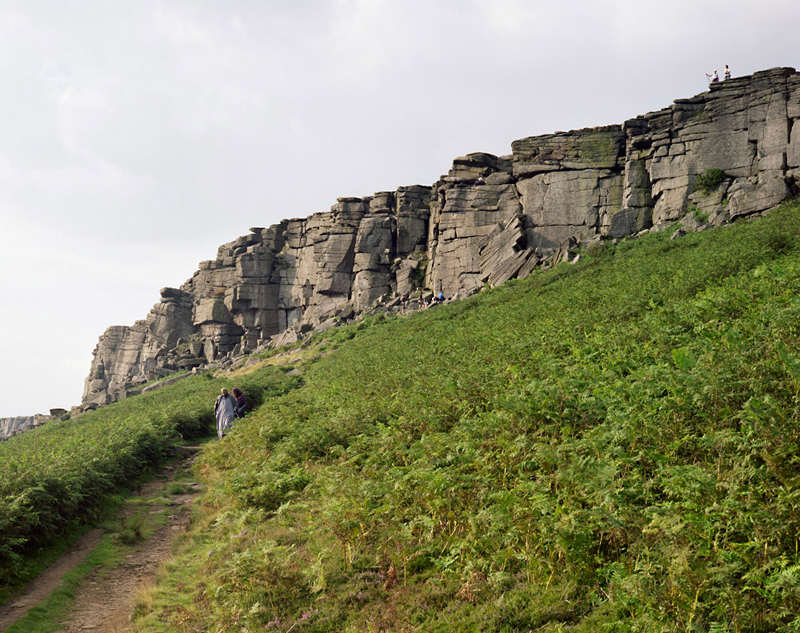 This photograph was taken at Stanage Edge in the Peak District, a popular destination for rock climbers. In the mid-ground a Muslim couple wearing distinctive grey robes follow a footpath down the hillside. 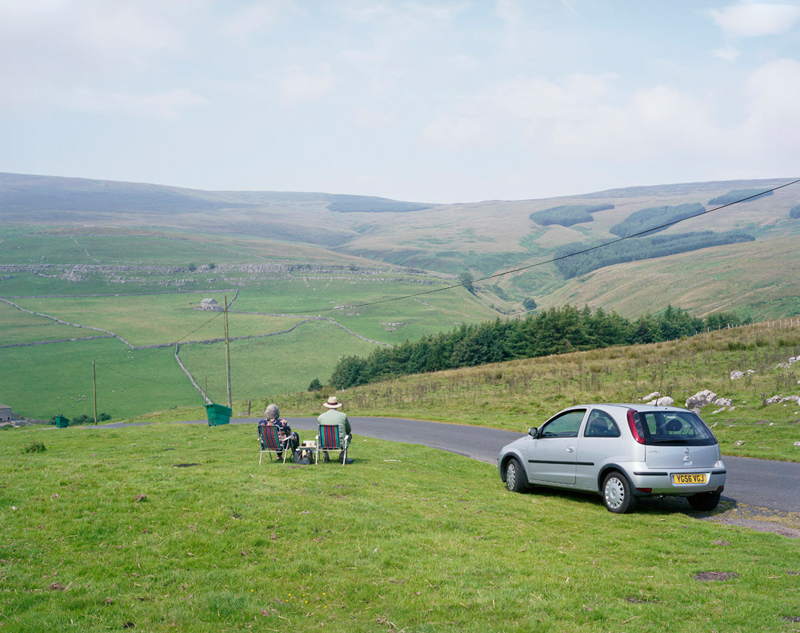 We tend to think of these kinds of views of rural England being inhabited by the white middle classes, and I like that this photograph challenges the stereotype. Talking to the couple depicted, I learned that they were from Leicester on a week’s walking holiday, staying at a B&B in the nearby village of Hathersage. They spoke of feeling completely at ease in the area and described how they often spend their holidays exploring the English countryside. Even in the centre of towns and cities, I found myself drawn to the green spaces, where there’s a definite sense of ‘going out into nature’; a sense that being in nature, however meagre, is a retreat from normal life: an opportunity for repair or rejuvenation, as well as an aesthetic experience. I suppose photographs like this one reflect that idea of a pastoral idyll; they stop short of being outright romantic interpretations of a scene and – like the figures that populate them – they are conscious that this idyll is a construct: an allusion to an imagined way of life. Here, local Sunderland AFC fans make their way down to the Stadium of Light, ready for the opening match of the season against Liverpool FC. The stadium opened in 1997, and was built on the former site of Wearmouth Colliery, a coal mine on the north bank of the River Wear. The colliery was the deepest mine in the world when it opened in the 1830s. As the fans wend their way down to the stadium, the atmosphere is almost one of pilgrimage. The name ‘Stadium of Light’ is a reference to a miner’s lamp. 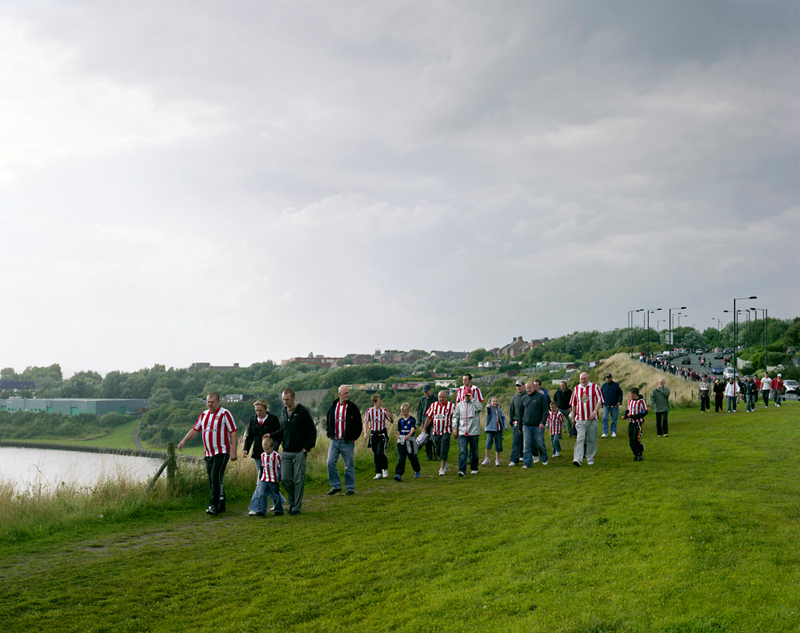 I imagine some of the older male Sunderland fans had worked at the colliery; indeed this walk to the football ground probably traced the exact path their fathers and grandfathers had taken to work every day. The low point of making this series was dealing with the unseasonably wet weather that blighted the summer of 2008. It was particularly bad in Cumbria, where the region saw almost an entire month’s worth of rainfall during the first twelve days of August. 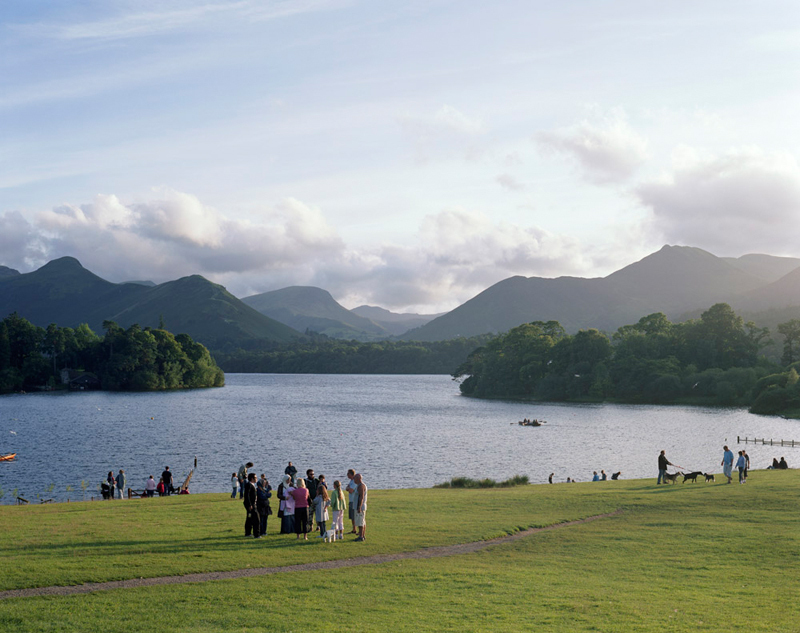 This photograph, on the shores of Derwent Water in Keswick, was taken at dusk after a heavy storm. Of course, the unpredictability of the English climate has long been seen as one of the keys to our national character. It has also informed much of the character of English art: think of the moisture which steams out of Turner’s canvases or Constable’s attention to atmosphere, which makes his paintings so clear and fresh. 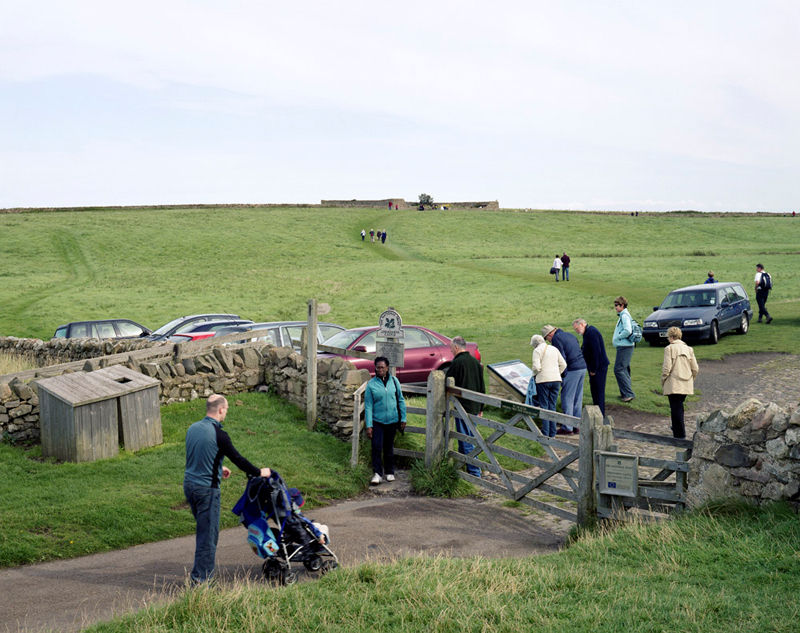 Lots of the leisure activities I photographed occurred at boundary points: the edge of cities, next to lakes and reservoirs, alongside footpaths and mountain ridges. This photograph shows the entrance gate to Lindisfarne Castle on Holy Island, a site owned by the National Trust. I liked this sense of literal and metaphorical boundaries, of ‘edges’ that are created or unconsciously preserved. 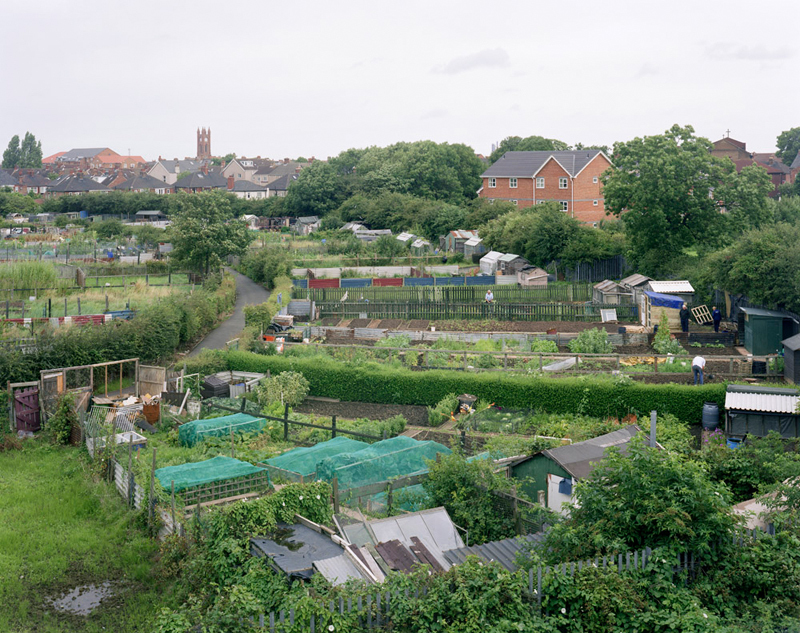 During the editing process, I noticed how many of the landscapes I photographed are shot through with rivers, trees and hedges that create physical divisions, just as the people themselves create their own personalised environments. These divisions impose a new structure upon the landscape and have a beauty of their own. 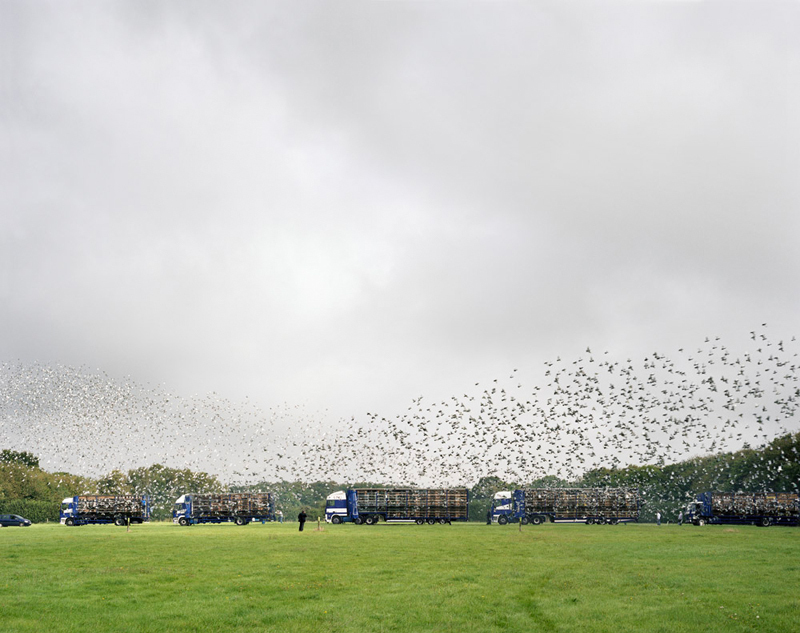 The book ends with this photograph of the liberation of twenty thousand racing pigeons in the Maidstone Young Bird Nationals from Kent Showground in Maidstone. The pigeons belonged to racers from the Up North Combine, and were flying back to their owners’ lofts dotted along the Northumberland coastline. This entry was posted on Monday, September 7th, 2009 at 9:02 am	and is filed under POST PRODUCTION, REVIEWS & PRESS. You can follow any responses to this entry through the RSS 2.0 feed. Both comments and pings are currently closed. It’s good to see the rationale for your pictures. Now I can see the reasons for your approach I am able to appreciate them more. I look forward to seeing some actual prints at the Photographers gallery soon. 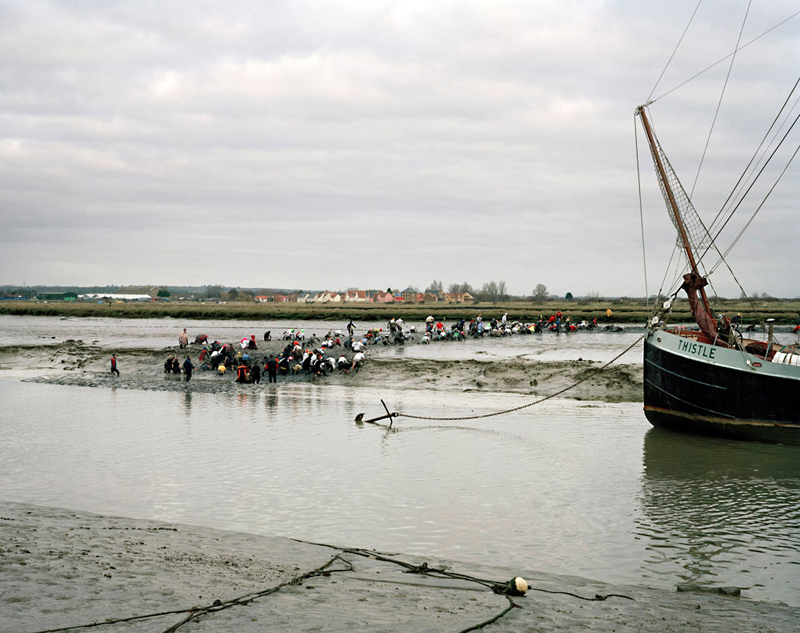 Excellent photographs that reflect everyday English life perfectly. One tiny gripe though, could you tag the places with the traditional county name (e.g. Bury, Lancashire, Keswick, Cumberland and Sunderland, County Durham) instead of the rather bogus “Greater Manchester” “Cumbria” or “Tyne & Wear”? 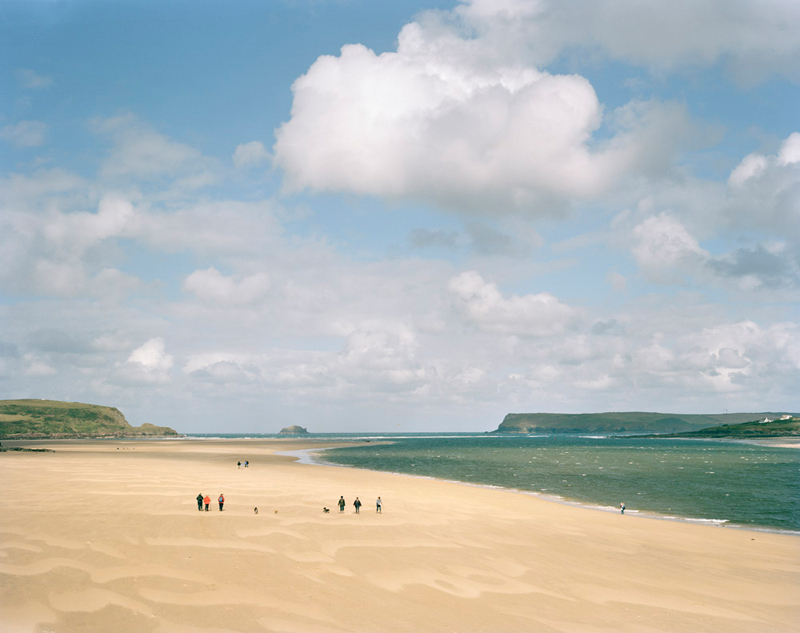 Very nice collection of images Simon, well done and good luck for the exhibition. As mentioned above some fantastic photos there, thank you for sharing. The one showing the pigeon racing reminds of the days when we use to own a pub and the local pigeon men would come down after the days racing. I wonder if any of you stopped at any point and thought that “we English” wasn’t just a little imperialist when it came to treating Cornwall? We Cornish are often ignored and it gets a little tiring after a while. Have you intentionally airbrushed the Cornish national identity out of your project or was it just simple ignorance on your part?